Jan Oort was a Dutch astronomer who made major contributions to our knowledge of the structure and rotation of the Milky Way Galaxy. More or less as a sideline, Oort studied comets as well and provided evidence for his theory, now widely accepted, that the Sun is surrounded by a distant cloud of ice-rock objects that has become known as the Oort Cloud. 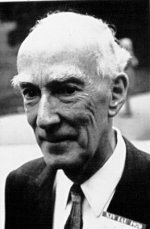 Oort studied stellar dynamics under Jacobus Kapteyn at Groningen and worked at the University of Leiden from 1924 to 1992. In 1927 he confirmed Bertil Lindblad's hypothesis of galactic rotation by analyzing motions of distant stars. During World War II Oort started his compatriot Hendrik van der Hulst on the successful search for the 21-centimeter neutral hydrogen line and after the war led the Dutch group that used the 21-cm line to map the layout of the Galaxy, including the large-scale spiral structure, the galactic center, and gas cloud motions. In 1950, based on his analysis of the well-measured orbits of 19 long-period comets, Oort proposed the existence of a vast repository of frozen cometary nuclei. He later showed that light from the Crab Nebula is polarized, confirming Iosif Shklovskii's suggestion that the emission is largely due to synchrotron radiation.